A sasara is a length of bamboo that has had the tips of one end split into many fine strands. According to tradition, the name comes from the Japanese word used to describe the sound that such bamboo makes when used as a whisk. Sasara has been used in Japan as a technique in bamboo workmanship since long ago. The process of sasara-zukuri is also known in popular parlance as “breaking the back” of the bamboo. Bamboo that has had its back broken again and again bends gently and draws a gentle curve. 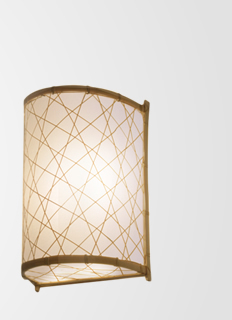 It provides a type of light containing gentleness unique to bamboo workmanship.